Learning through experience is a critical path towards conceptual understanding. All aspects of computer science from coding to digital designing are too often perceived as insurmountable tasks. We at the CERTA Learning Center believe that all learners are capable of acquiring computer science skills and offer our summer Computer Science Camp to provide your child an opportunity to build a computer, learn the fundamentals of coding, and design and create digital content such as video games. Campers will begin by building their own computer and design their own software throughout the camp. Our goal is to create a space where the next generation of computer scientists can delve into the world of coding. We believe that children were meant to code and create digital content, and we hope spark an interest either for life-long learning to future careers in computer science. We encourage learners of all computer science backgrounds to discover their potential in the infinite digital universe while utilizing fundamental learning skills to prepare for problem solving in the future. 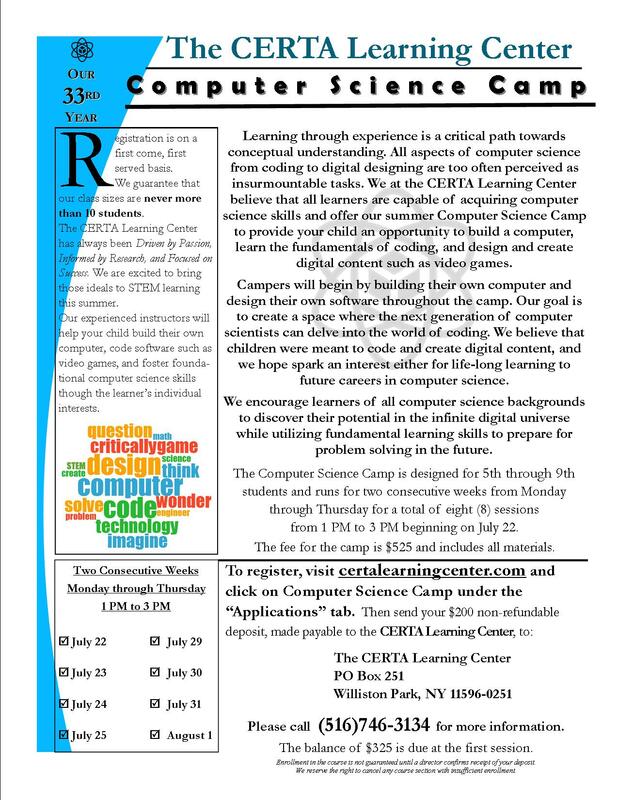 Please complete the following form for the Computer Science Camp offered at The CERTA Learning Center.